Check Chains are designed to be used as training tool to correct your dog's behaviour, not to be used as a day to day collar for walking your dog and we recommend that experienced owners use them only or under the supervision of a qualified dog trainer. Check Chains are also referred to by some as choke chains are simply a chain loop that slips through itself to create a collar or noose. 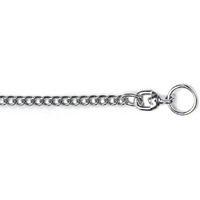 The check chain is placed around your dog's neck, behind the ears and when your dog pulls the chain tightens around the neck to indicate to the dog to stop the behaviour and listen to their owner. 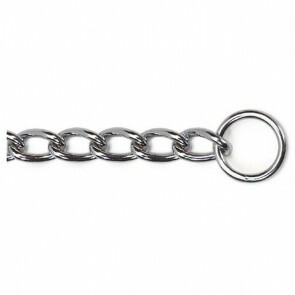 All the ancol check chains displayed on the website are made from mild steel and high quality chrome plating. Each link is welded, an essential feature when selecting a strong reliable choke chain. We stock a large range of Dog Collars & Leads suitable for all breeds, just look at the other pages on this website. Check Chains Collars: 5 stars out of 5 based on 0 user reviews.